Shure MV88+ Video Kit is a premium digital stereo condenser microphone for mobile high&dash;fidelity video and audio recording. 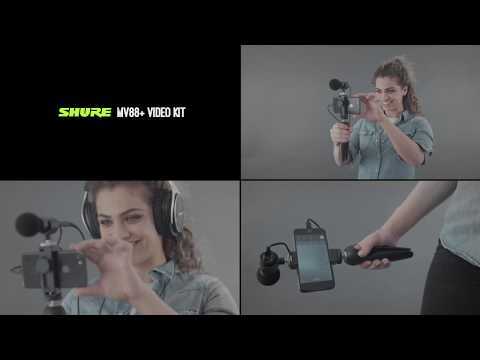 The MV88+ Video Kit is your mobile professional recording rig. Package includes Manfrotto PIXI Tripod, phone clamp & shoe&dash;mount mic clip, USB&dash;C & lightning cables, making it ready for audio and/or video capture right out of the box. The free ShurePlus MOTIV audio & video Apps enable recording control, and the ability to save and share your content in multiple formats. The MOTIV MV88+ Video Kit is a premium Digital Stereo Condenser Microphone. Your new mobile recording rig directly connects to any Apple device via a Lightning connector, or via USBC to select *additional devices. The MV88+ has all you need to capture great content right out of the box. The included phone mount is also compatible with your existing set&dash;up, allowing to connect to any tripod with a ¼”&dash;20 (or ¼ camera tripod) connector. The free ShurePlus MOTIV audio & video Apps enable recording control, and the ability to save and share your content in multiple formats. Apps include real&dash;time audio control, including five built&dash;in DSP preset modes (Speech, Singing, Flat, Acoustic Instrument, Loud), microphone gain, stereo width, and high&dash;quality 24&dash;bit /48 kHz recording. The MV88+ Video Kit is the perfect high&dash;fidelity solution for mobile capture of all variations: live performance, field recording, interviewing, audio for video and vocal and instrument recording.